There have been a number of recent pre-budget leaks about an up to 18 cent increase in diesel pump prices. Is a price increase on diesel necessary? Why? There are compelling health reasons why diesel prices should increase at pumps. Not least the World Health Organization’s (WHO) recent classification of air pollution in general and diesel specifically (but not petrol) as Group 1 carcinogens, that is like cigarette smoke. There are two main concerns about the pollutants released from diesel powered cars, trucks, taxis and buses. The first concerns emissions of nitrogen dioxide gas, which gets into our blood system and as an oxidant causes irritation/inflammation of the artery walls. That leads to a build-up of plaque and subsequent cardiac conditions like strokes. This killer accounts for about 6000 deaths in London alone every year. The point is that much more of this product of combustion is released from diesel vehicles in comparison to petrol cars. These health effects are the main reason that legislators and enforcement agencies were so ticked off about the manufacturers of VW diesel cars recently: they had installed confounding software on their vehicles to artificially lower the apparent emissions of nitrogen oxides. Small particle emissions are important too especially for asthmatics because they can get deep into our respiratory systems. About 50-100 asthmatics die every year in Ireland because of attacks as the new CEO of the Asthma Society, Averil Power said a week or two back. The number is backed up by a recent study in the UK that estimates 1000 deaths occur there annually with the cost of asthma treatment being £1.1 billion a year! In principle diesel cars have filters fixed to them to eliminate small particles from being emitted directly. This is a good strategy if the filters are maintained but sometimes they are not and it is not unusual that they are removed completely by owners. The fact is that there is no testing performed at our NCTs for either small particles or nitrogen dioxide emissions. Oddly the stated reason from the Government for tax equalization with petrol is not centred on health but for climate policy reasons. This strikes me as strange. Obviously we should attempt to stop burning all fossil fuels to prevent catastrophe with climate change, a fact that has been true for 150 years. Instead the Irish government, for years, has given diesel tax breaks in pump price, annual car tax reductions and even subsidies to truck companies. The strategy was /is entirely based on the fact that kilometer for kilometer diesel emits less of the greenhouse gas, carbon dioxide to the atmosphere than petrol does. Why the change of heart now? And why not cite health as the reason? Maybe it’s because by its policy of subsidizing diesel (despite them knowing of the health effects) the government has been complicit in increasing heart disease, cancer rates and asthma in the country. Lots of people say that the proposed diesel price increase is yet another stealth tax imposed by the Government. And it will discriminate against those living in rural environments because they depend so much on their own transport. Fortunately, some of these thorny issues may soon disappear. 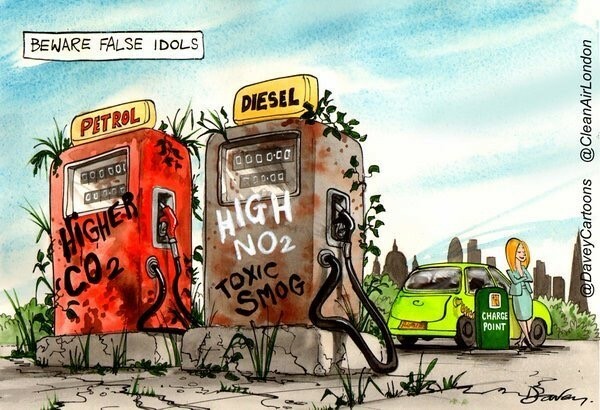 Consider this: authorities in the Netherlands are currently meeting to decide whether the sale of both petrol or diesel cars should be stopped starting in 2025! This may sound drastic but the position is consistent with the Intergovernmental Panel on Climate Change (IPCC) talks in Geneva going on this month, where scientists will start to outline ways to implement the climate goals set in Paris. (Remember the 1.5 C raise global temperature limit that we are very close to breaching even now in 2016). At the meeting, dates for abandoning all coal-burning power stations and halting the use of combustion engines across the globe – possibly within 15 years – are likely to be set. What could/should we be doing now? One thing that could be done without the need for government interference would be for insurance companies to no longer offer cover on diesel cars! Many now will not insure cars that are more than 15 years old; not for pollution reasons, of course, but because they are likely to be less well maintained and are involved in more accidents. But it might represent a neat interim measure to no longer provide insurance for them! Government would not then be to blame……..and they would like that I guess. Ok that’s all well and good but what about buses and trucks? The Chicago bus transit system has been moving over recently to an electric powered bus fleet. Not hybrids. Not trams. Not LUAS. Just driven standalones. Why not do the same thing in Ireland? Trucks may be able to use fully electric technology at some time in the future but in the interim the only answer is for diesel levies to be introduced. The costs will be passed on to customers, no doubt, but at least they will not be under water or living in a country that is obliged, for humanitarian reasons, to house millions of climate change refugees fleeing from places like Bangladesh. Maybe, for the interim, the cash from the levy could be used for developing solar energy technology and improving battery storage capacity. It could also be used for investment in the health service because so many patients are now being treated (or dying) from air pollution related dieseases. This approach would involve the concept of predicated money, yes, and no government likes to do ring fencing of finance. But planet Earth may be in a new era of danger now because of climate change. So politicians must change their attitudes. It is not business as usual. It’s time to go chasing the sky.